A British man accused of trying to join and fight for the Islamic State group has said he just wanted to go to Syria to "big himself up" on his return. Hanzalah Patel, 22, of Frederick Road, Leicester; and Safwaan Mansur, 22, of Hampton Road, Birmingham; deny preparation of terrorist acts. Mr Patel said attempts to cross into Syria were just "thoughts and banter". 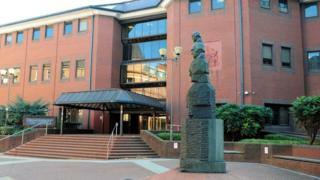 He also told Birmingham Crown Court he thought getting into the country would be a "walk in the park". The prosecution alleges both men, arrested at an Istanbul hotel in June 2017, were trying to arrange a border crossing to join Islamic State in Syria. The court heard the two men first travelled to Istanbul in 2016, with the aim of getting into Syria. Mr Patel said he wanted to go there to "big myself up" on returning after taking some pictures and talking to local people. "There was never a real concrete plan of what I wanted in there. It was just thoughts and banter," he told the court. They returned home after a contact failed to answer calls. In 2017, both defendants travelled to Istanbul again in a second attempt to get into Syria. Mr Patel told the jury he wanted to take videos and pictures and talk to local people. Asked what he thought of it now in 2019, Mr Patel said: "It's kind of pathetic. I have messed my whole life up. "It seems ridiculous just in hopes of impressing people and big myself up. I think I was lost in the head." The court previously heard the pair were arrested by a US agent in a hotel lobby and spent nine days in a Turkish prison. Mr Patel, 22, of Frederick Road, Highfields; and Mr Mansur, 22, of Hampton Road, Aston; both deny preparation of terrorist acts between 31 May 2017 and 24 June 2017.